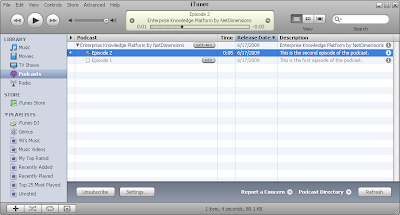 In EKP 5.6.0.129 we have added support for RSS enclosures. Roughly speaking, RSS enclosures serve the same purpose as email attachments—they make is possible to attach a file of arbitrary type to a text message. Probably the most interesting consequence of this change is that it's now possible to use the News Manager to publish a podcast. Here's how. Record a podcast episode, edit it as necessary, and save as an appropriate media file (audio or video). There are many tools available for recording, editing and encoding media files. For audio, we suggest Audacity for recording and editing, with the LAME MP3 encoder to generate MP3 files. 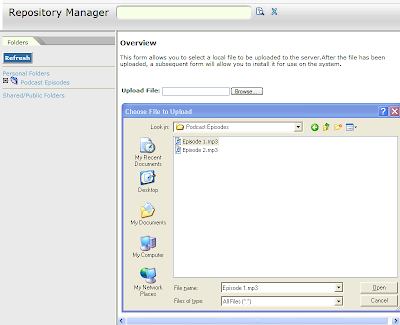 Upload your media file to the Repository Manager. Create a news article in the News Manager. For the File Attachment URL field, select the media file you uploaded in the previous step. Make sure the article is targeted to the appropriate audience, and publish as usual. 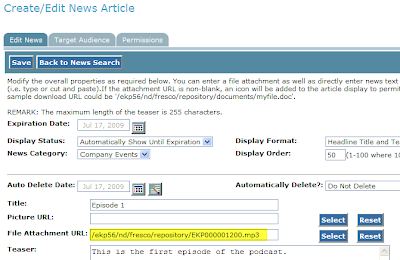 A listener/viewer can subscribe to an appropriate RSS feed using a “podcatcher” such as Apple's iTunes. The podcatcher will download new podcast episodes as they are made available. The episodes can then be played offline, and can also be synchronized to devices such as portable MP3 players and phones. EKP provides an application programming interface (API) that enables other applications and Web sites to interact with EKP—for example, to create user accounts and enrollments, and to obtain information about courses, catalogs, enrollments and training records. 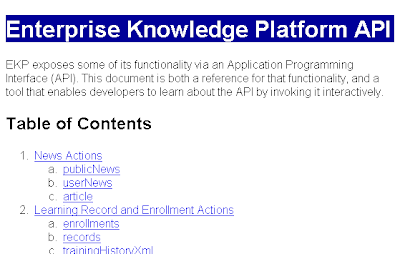 We've always provided API documentation as part of the EKP distribution. However, in working with software developers, we've identified a couple of ways in which the documentation could be improved. Firstly, the API changes between releases as new API functions are added. This means it's important to work with the correct version of the documentation for the EKP version you're developing for. However, keeping track of different document versions is a hassle. Secondly, most developers learn more easily if they are able to call API functions interactively and generate actual responses, rather than simply reading dry documentation. However, calling API functions generally involves writing code. With these points in mind, in EKP 5.6 we introduced the API Explorer. The API Explorer serves two purposes: it is both an online reference for the API functions, and a tool that enables developers to learn about the API by calling its functions interactively. The API Explorer can be accessed by appending api/ to the base URL of your EKP site. For example, if your site is located at http://www.example.com/ekp/, then the API Explorer for the site can be accessed at http://www.example.com/ekp/api/. 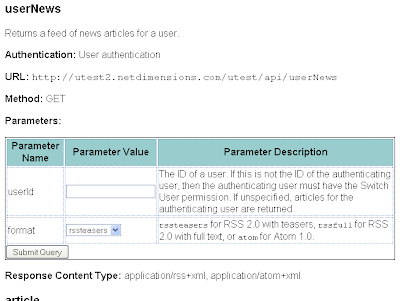 At the time of writing, an instance of the API Explorer is available at http://utest2.netdimensions.com/utest/api/. Note: If you do not see the API Explorer at the expected URL, your Web server (e.g. Apache or IIS) might not be forwarding the requests to Tomcat. In the case of Apache, you can fix this by adding a directive like the one below to httpd.conf. EKP 5.5 introduced the ability to create new revisions of existing courses. This simplified the process of updating an existing course, and made it possible to keep track of which version of a course a learner was taking or had completed. When you created a new revision of a course, EKP would automatically make the new revision available to learners who were enrolled in, but had not yet started, an earlier revision. EKP also provided the option to make the new revision available to learners who had already started, but had not yet completed, an earlier revision. Since we released support for course revisions, several of you have told us that you also needed to be able to make new revisions automatically available to users who had already taken and completed an earlier revision of the course, so that those learners would see the latest content if they reviewed the completed course. So, as of EKP 5.6.0.122, there is a third option when creating a new course revision, which publishes the new revision to all learners, including those who have already completed an earlier revision. We hope this makes course revisions in EKP even more useful. EKP features bulk import utilities for both SCORM and AICC content. Using these utilities, you can package multiple courses into a zip file which you can then upload. EKP will create online modules based on the course descriptions in the zip file. In addition to information on how to launch and track the courses, EKP will extract descriptive information such as course titles, descriptions, objectives and so on. This is extremely handy if you need to import catalogs of hundreds or even thousands of courses. Previously, the ID fields that EKP would use for the new modules would also be extracted from the course description files. While this usually works well, it fails if the course description files contain duplicate identifiers, since each module in EKP needs to have a distinct ID. This might happen for example if the course description files were created by copying a template and making only minimal changes. Starting from version 5.6.0.119, the bulk import utilities provide an option to generate module IDs based on the file names of the imported items instead of the identifiers contained within course descriptions themselves. This provides an easy way to import large numbers of courses even if the identifiers within the course descriptions are not distinct. The default is to use the identifiers specified in the course description files, as before. If you choose to generate IDs based on the file names and the items being imported are content packages, the IDs used will be the names of the “inner” zip files, without the .zip extension. If the items being imported are sets of AICC course structure files, the IDs used will be the base file names—for example, if one of the sets uses the file names course1.au, course1.crs, course1.cst and course1.des, then the ID used will be course1. We know that many of you rely on the bulk import utilities to set up and updates your course catalogs, and we hope that this change makes them even more useful.